After a clear card option has been installed in a Datacard card printer SP35 Plus or SP55 Plus, a card jam error my occur. The same error may occur when after replacing the main control board. To clear this error the printer will need to determine the sensor type. For the printer to recycle through and make this determination, a power on test card is required using the appropriate clear or opaque card type to force the firmware to redetermine the sensor type. Each time the card is changed from clear or opaque to the other type, a power test card will be necessary to redetermine the sensor type. 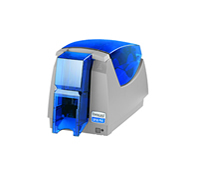 For additional information about Datacard printers currently on the market, SP25 Plus, SP35 Plus, SP55 Plus and the SP75 Plus, contact our id card experts toll free at 888-485-4696. This entry was posted in Datacard Printer and tagged card jam error, Datacard Printer, SP35 Plus, SP55 Plus on December 15, 2008 by SafeCard ID Team. Our Datacard SP35 Plus printer provides us with constant ribbon breaks. We are printing with YMCKO print ribbon. The printer will only print about one in 50 cards correctly. The ribbon looks like it is stuck to the card when it breaks. Any ideas? 1. Check the print head temperature to make sure that it is hot enough to transfer the ribbon to the card. 2. The surface of the PVC card may not be image compatible. Try another brand of card or opt to 60/40 composite cards for testing. For additional information about the current Datacard printer models, let our id card experts provide you with a free consultation. This entry was posted in Datacard Printer and tagged Datacard Printer, Datacard Technical Support, SP35 Plus on November 14, 2008 by SafeCard ID Team.